The cabin headquarters are getting way too familiar. Bed time moves back each day, but it does stay light until 11 p.m.
Steve West of “Steve’s Outdoor Adventures” took his show on the road for bear hunts in the Alaskan wilderness. Through April into early May, West and his team awaited the warm-up that would bring bears out of their dens. Click here to see his entries and photos from April 8 to April 12. WOW. Warm up! 36 degrees and sunny by noon. While we wait for word from the pilots flying for bears, we decide to help Jeremy cut and stack firewood. This turned out to be a recreational event on snowmobiles and we learned a few things; (1) Jeremy is not going to try out for a spot on “Ax Men” -- he can’t drop a tree to save his life, but then again he is a bear guide not a logger! And (2) in deep powder it is hard to pull a sled loaded with firewood without getting stuck, a lot! But in short order, and working as a team, we drop, cut, split, and stack a cord of firewood for Jeremy’s cabin … and got a little exercise along the way… word comes in from the pilots, no bears but it was almost 20 degrees, so it is a lot warmer than yesterday. Got word from home via a text on my DeLorme InReach … “Call Home.” I call and find out from my wife that our two Saint Bernard dogs got out of the yard and the puppy was picked up by animal control. Despite my calls he has to spend the weekend in puppy jail, which does not make my wife happy. And being in the Alaskan wilderness does not make it easy to fix the problem. I try one more time to get the puppy out of jail but on a Sunday it is not possible. So I get back to the task at hand. We are bear hunting, and this hurry up and wait game is driving me mad. Spring is running 10 days behind schedule. They had an amazingly warm winter and in mid-February we were predicting an early spring season for snow bear hunting … all changed in early March when snow piled up and temperatures dropped. The temperature today hits 40 degrees for a high at the cabin! It was -3 degrees last night but 40 degrees for a high, surely bears will pop out today. 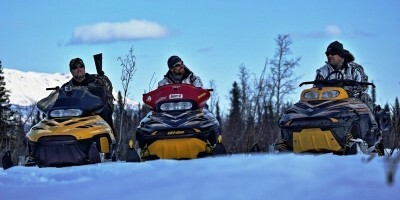 We load the sleds and make a ride to the west to check some other mountain sides and look for bears popping out of dens. We rode 28 miles round-trip and saw nothing! Pilots flew and call in saying temps were in high 20s between 1,500-2,500 feet but no bear dens spotted yet … we hurry up and wait some more. My 41st birthday. I am sure we will not see bears today; I have rotten luck on my birthdays. I get word that my lovely wife has recovered our puppy from the pound after paying a $100 fine. We discuss a plan for securing the yard to prevent future escapes. By noon the temperatures are over 40 degrees and the planes are in the air looking for dens …. Late afternoon they return, no bears spotted but the daytime high of 42 degrees has everyone hopeful.Scott Carr is close to being nominated for the “most patient hunter of the year” award. Our problem is single-digit temperatures at night and daytime highs in the 20s up where the dens are located.We have plans for a massive flying campaign tomorrow. Hurry up and wait … it gets colder, daytime high of 39 degrees. We glass Yenlo and surrounding hills from the ground … no bears. The pilots report back … no bears or dens spotted.Cameramen Ian Majszak and Dan Lee are a constant source of entertainment. Ian sings and Dan says things you can only laugh at all the time. They are also constantly filming and so far this trip we have captured some of Alaska’s truly epic features like we have never filmed them before … these guys are working hard to get us the film we need while waiting for some bears to pop out of their dens. I discover we are sleeping in later and later every day … but going to bed later and later. This will create some sleep habits when I get home that will take a few days to change. The planes don’t fly until noon, and it is too cold for bears to pop out until afternoon sunshine warms the hillsides … and it stays light until 11 p.m.! The daytime high hits 41 degrees -- getting better again! But once again the pilots spot no bears, no dens, but do report a warm up in the hills!